OAKLAND, CA -- The Houston Astros have a winning vibe during the September stretch run. Tony Kemp noticed it before Tuesday night's 2-1, 10-inning win against the Oakland Athletics. "Before the game today, everyone seemed loose," Kemp said. "No one's really panicking. Everyone's just having fun this last stretch." George Springer hit a go-ahead single in the top of the 10th inning. Kemp, who tied it with a pinch-hit double in the seventh, got things going with a leadoff double against Sean Doolittle (2-3) and Jake Marisnick sacrificed him to third to bring up Springer. Chris Devenski (4-4) struck out four in 3 2/3 innings of relief for the win, and Ken Giles escaped a bases-loaded jam and closed it out for his 13th save. The Astros remain in the mix for the AL wild card. "The dramatic finish at the end, it's hard to overlook," manager A.J. Hinch said. "There are so many story lines that go on why we won a close game. ... Our guys understand where we're at in the calendar. We've played important games late." Jose Altuve's eighth-inning single gave him 200 hits in three straight seasons, the first to do so since Ichiro Suzuki from 2001-10. Oakland's Danny Valencia was ejected at the end of the ninth by plate umpire Marty Foster after striking out. It was announced that the A's played the game under protest after a call was overturned on replay review in the third. Marisnick was initially called safe on his bunt and that was overturned, but Teoscar Hernandez -- aboard on a single -- got to return to first base rather than be called out on a double play because he reacted to the original, incorrect call. Oakland briefly protested before withdrawing it, both managers said afterward. 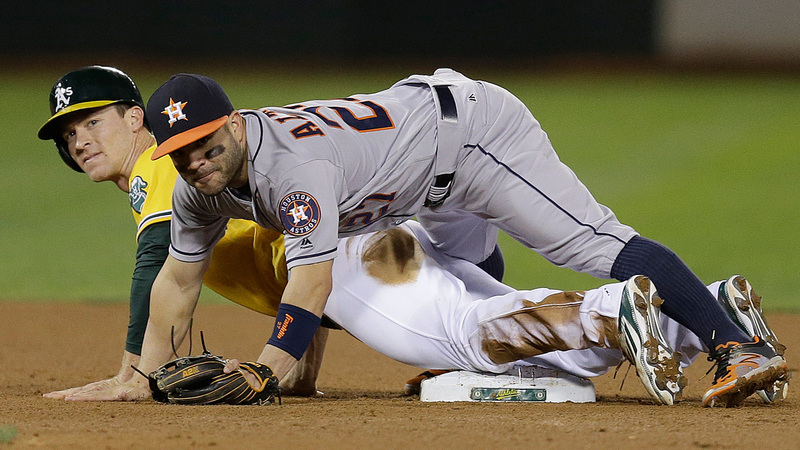 "It ended up just being a really weird play," Hinch said. Sean Manaea struck out seven with two walks over six scoreless innings. The lefty allowed three hits in his second start since missing 15 days with a strained muscle in his upper back. "That was one of his best outings of the season and to squander it is incredibly frustrating," Doolittle said. Oakland has lost six straight to the Astros, its longest skid ever in the series. Jake Smolinski's sharp single through a shifted infield with one out in the sixth was the A's first hit against Astros starter Joe Musgrove, who then loaded the bases and was done for the night. The rookie right-hander, who beat the A's earlier this season when he pitched 5 1/3 scoreless innings, gave up two hits and one run, struck out four and walked three. Devenski relieved Musgrove and allowed Stephen Vogt's RBI groundout. "It's incredible," Musgrove said. "This team's got so much fight in it." Vogt, the Oakland catcher, was named the 2016 Dave Stewart Community Service Award winner and will be honored before Wednesday afternoon's series finale. Vogt earned the award for a second straight year, the first two-time winner. He and wife, Alyssa, support the School of Imagination in Dublin that offers services and support systems to more than 350 children, many with special needs and disabilities such as autism. "We have a duty to the Bay Area," he said. Astros: Manager Hinch will pick his moments to use OF Colby Rasmus, who has struggled since he came off the disabled list Aug. 30 after surgery to have a cyst removed from his ear. Rasmus is in an 0-for-17 stretch. "No doubt he's had a rough season on a lot of levels," said Hinch, who still expects Rasmus will contribute down the stretch. Athletics: RF Khris Davis was a late scratch because of a stomach bug that had him throwing up during the day. Valencia replaced him in the lineup. ... RHP Sonny Gray threw a 48-pitch bullpen session and the next step for him in his recovery from a strained right forearm will be to throw to hitters this weekend, the day still to be determined. ... RHP Henderson Alvarez, who hasn't pitched in the majors since May 2015, underwent a second surgery on his right shoulder Tuesday. It was performed by Dr. James Andrews. Astros: RHP Collin McHugh (11-10, 4.66 ERA) is 2-0 with a 3.31 ERA so far in September. He is 10-0 in 12 September starts with the Astros dating to 2014. Athletics: Rookie RHP Daniel Mengden (2-7, 5.68) looks to win consecutive starts for the first time all season.